Clean, simple and no threshold! The NEW Safe & Easy Wet Room is the very latest in modern shower design, hassle free and luxurious. This superb new shower module has everything you could possibly want already built-in, so fitting is quicker, cleaner, neater. The Exquiste shower from Nationwide Mobility is stylish yet practical offering you the best of both worlds, no one would ever know you had bathing difficulties. 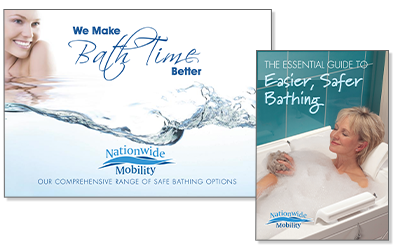 Nationwide Mobility are proudly the leading supplier of bathlifts in the UK. We offer a no obligation free home demonstration service where you can try all of our bathlifts in the comfort of your home to ensure that you choose the bathlift that best suits your needs before buying. To book a free home demonstration just call 0800 316 0116 and one of our friendly advisors will be happy to help you.